Apple Chief Executive Tim Cook sat down for an interview with ABC News about the 30th anniversary of the Mac, but the conversation naturally delved into other subjects like future products, on which the CEO was unsurprisingly tight-lipped. 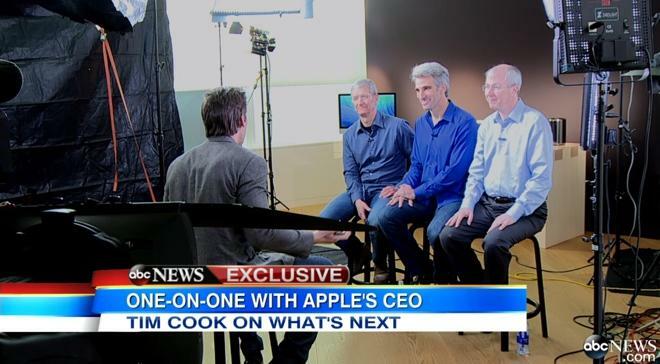 Reporter David Muir of ABC sat down with Cook, as well as Craig Federighi, Apple's head of Software Engineering, and Bud Tribble, vice president of Software Technology. Though the full interview is set to air tonight, an excerpt from their conversation was played Friday morning on Good Morning America. Muir quizzed Cook about Apple's recent start of manufacturing the new Mac Pro desktop in Austin, Tex. On that front, Cook teased that he thinks Apple can "do more," which led Muir to ask about the company's new sapphire glass manufacturing facility in Mesa, Ariz.
Cook confirmed that the facility is to build sapphire crystal glass, but declined to go any further when asked whether that glass could be used for a larger iPhone. As Muir continued to press Cook about potential uses for the glass, the CEO finally said with a laugh: "It's for a ring." The jovial comment from Cook could be in reference to a so-called "iRing" rumor from last year that gained considerable attention and was the subject of many jokes. Analyst Brian White of Topeka Capital Markets said last April that he believed Apple was working on a ring-shaped accessory that could allow users to control their television set. While Cook's joke suggests a high-tech ring probably isn't in Apple's near future, the CEO said little else regarding his company's future plans. 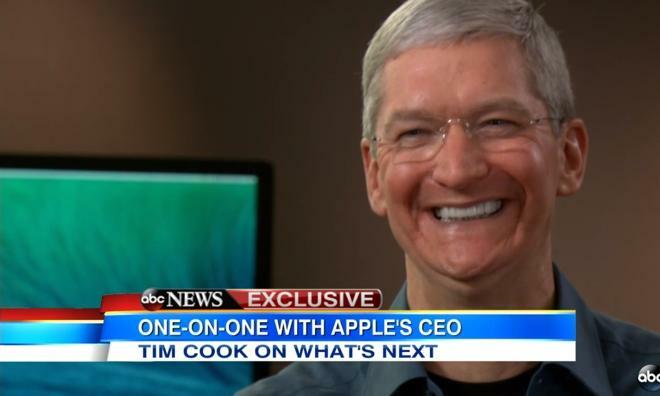 He said Apple executives believe people enjoy being surprised, and that's part of the company's approach. When asked by Muir to comment on Apple's legendary secrecy in developing products, Cook did confirm that some of the stories he's heard are true. For example, there are employees who can't tell their families at home what they're working on, and there really are black drapes that keep secretive products out of view. "Yes, there are black drapes, and numerous locked doors, and many other things," Cook said. He also warned Muir that although the interview was being conducted at Apple's headquarters in Cupertino, Calif., the reporter wouldn't be able to access the company's secret labs. "Your badge probably wouldn't work in those rooms," he said with a laugh. Finally, the CEO also talked about how he wakes up every day at 3:45 a.m., and reads hundreds of personal emails from Apple customers. He said the ability to see firsthand how his company's products affect people's lives is a "privilege."